Payroll System - CRM, Sales Automation, Marketing | Tecso Solutions " "
Bagging multiple industry awards, Sage EasyPay is a leading payroll and human resource management software that has been well used and trusted by over 10,000 businesses ranging from SMEs to MNCs. As global and local business landscapes are constantly changing, HR practitioners today demand a system that is not just reliable and efficient, but also configurable, intuitive to use and able to handle ad-hoc and unexpected cases. Our product does just that. Sage EasyPay is one of iSprint’s pre-approved packaged solution. Bagging multiple industry awards, Sage EasyPay is a leading payroll and human resource management software that has been used and trusted by over 10,000 businesses ranging from SMEs to MNCs. As global and local business landscapes are constantly changing, HR practitioners today demand a system that is not just reliable and efficient, but also configurable, intuitive to use and able to handle ad-hoc and unexpected cases. 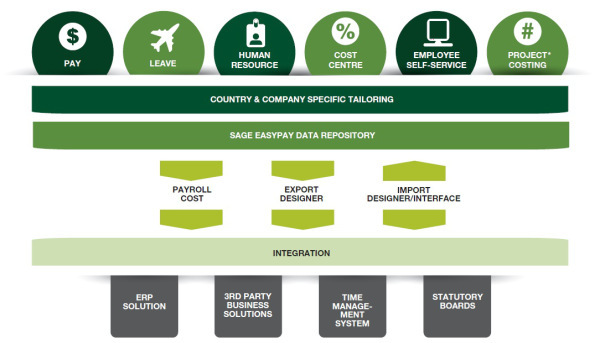 Sage EasyPay is a module-based system that empowers HR professionals to pick the exact solutions that befit your business requirements, including payroll, leave and claims, projet costings and employee self-service. As the business expands, you can easily add more modules to the system. The Sage EasyPay Suite comprises of multiple modules. They are compatible with external solutions such as Enterprise Resource Planning (ERP) and Time Management System. Sage EasyPay is iSprint pre-approved packaged solution. Sage EasyPay is a listed under iSprint pre-qualified packaged solutions where approved SMEs can enjoy up to S$20,000 of funding support. Visit IMDA website for more information. Copyright © 2018 Tecso Solutions Pte Ltd. All rights reserved.